The Carmanah Light prepared to act as anchor light mounted on our mizzen boom. Another problem we had with our new (old) boat was that we had no masthead anchor light. “We just hang a lantern in the rigging, it’s much more visible lower down,” the owner said. Yes, we bought into this as well, and in fact we quite seriously subscribe to this thinking. Our boat came with a (very useful) light which we plug into a 12V outlet and hang it in our rigging at night. It also makes for a great cockpit light. Because of this we have installed 12V receptacles at various strategic points throughout the boat including one in a cockpit locker. In this case, we do have wiring going to our main-masthead, but that goes to the tricolor. To do the combination tricolor/anchor light, we would have to run another wire up there, and buy the rather expensive combo light. In comes Carmanah with their Model 501 solar powered LED (light emitting diode) lights  another really neat product. Using a Fresnel type lens, they are stated to be visible up to one nautical mile, and meet the requirements of the US Coast Guard in 33 CFR part 66 for Private Aids To Navigation. 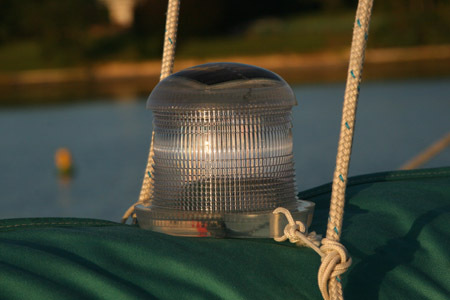 Though sold primarily as dock lights, we thought it might make a good anchor light as well. 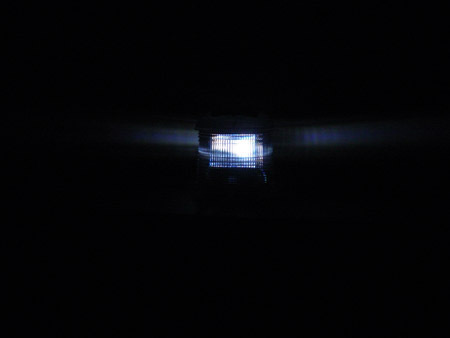 The Carmanah solar-powered light emits a visible light throughout the night via a fresnel-like lens. According to Carmanah, the Model 501 is the world's most advanced, fully integrated solar-powered LED one nautical mile marine hazard-marking light. It installs in minutes and requires no maintenance or servicing for up to five years. They say that the 501 will withstand many years of harsh environmental conditions including submersion, vibration and intense sunlight. It charges during the day, even under cloudy conditions, and turns on automatically at night. These lights are available in green, red, amber, white and blue light output with one of five standard flash patterns (10, 15, 30, 60 flashes/min & steady-on)  so, for our purposes the choice was easy; white and steady on. For the strict day-sailor, these lights are perfect. They can have a masthead light that is ‘on’ every night. A problem? Absolutely not! So what if the light is on every night? The colregs state that you must have an anchor light on when at anchor. They do not state you cannot have one on when you are at your dock or at a mooring. And what harm is it to have your boat illuminated at a mooring, warning an errant boater that your boat is ahead? This is perhaps a good way to keep boats traversing the mooring field from playing bumper boat with your beloved vessel. We were about to install the light permanently on our mizzen masthead when we realized that we do spend many an evening and night underway. 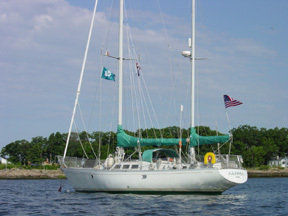 In this scenario having an all around light at the top of our mast would send conflicting messages to an observer on another boat  say sailing and expecting to be the stand-on vessel. What we have done instead is to charge the light outside during the day while cruising and then mount it in a visible place at night  on top of the boom. And yes, after some serious reflection, we do very much agree that the lower placement of the light is better, as it is indeed more in line with where people will be looking as they approach our boat. Just picture that a fast boat, even a dinghy, motoring through an anchorage will not see a little light 60 odd feet up in the sky, but will most certainly see a light 10’ above water level. Is TackTick a good tactic? Wireless instruments for every boat. Install and anchor light or dock light without running wires. A word on civilized communication during maneuvers. Can you hear me now?